It’s hardly the right time of year to go galavanting around the countryside in a convertible, but Mercedes did ask really nicely and who was I to turn them down? 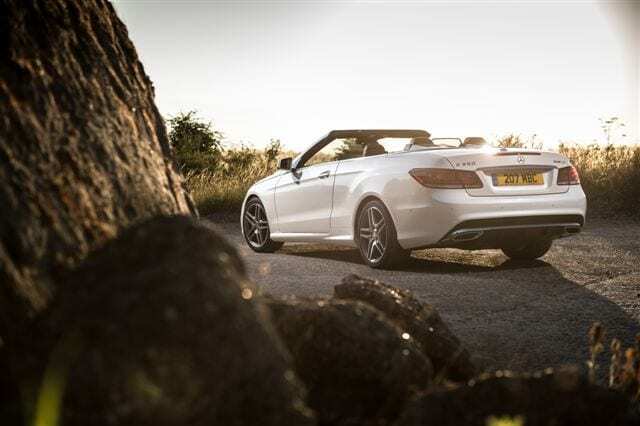 From some angles, the new E Class Cabriolet, as with its stablemate the hard-topped Coupe, doesn’t look that different to its predecessor but while the overall shape has seen few changes there are plenty of new bits to pick out in this, the latest version of the E Class’s sporty cousin. 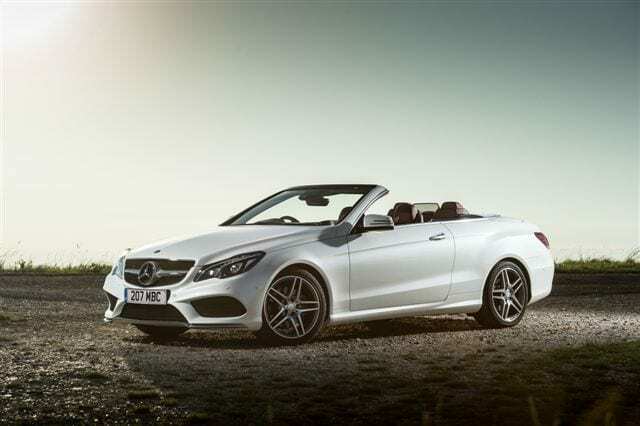 Turning one of the world’s best-known executive saloons into a coupe and convertible must have been a headache for the Mercedes Benz designers but this is the second time they’ve had a pop at it and they’ve done a really good job. It looks even better in the flesh than it does in pictures. It looks especially good from the front, with its new twin headlights replacing the squarish quad lamps on the old model and a sculpted front end with sharp angles and an even more prominent version of that iconic three-pointed star badge Mercedes is so synonymous with. Gone now are the LED lights in the lower front bumper, the daytime running lights are now part of the stylish new light clusters which are big and bold. The whole effect is bold and striking, especially in the bright white of my test model. 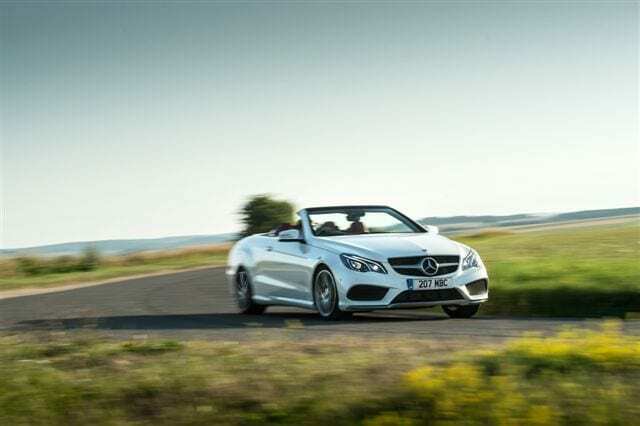 But convertibles are all about showing off. Aren’t they? The engine range has stayed largely similar to the previous E Class with petrol versions offering up 181bhp to 328bhp, and the diesels giving 168bhp to 248bhp but they’re now more efficient and most come connected to the seven-speed automatic gearbox. As a reflection Merc’s more frugal approach, the top-of-the range petrol offering that was once served up in the V8-powered E500 has been trimmed down and the new E400 is fitted with a three litre, twin turbo V6. Diesel options start with the noisy but very economical E220 with its 2.1 litre lump and then there’s the more powerful version of the same engine in the E250. The pick of the bunch is definitely the sublime three litre V6 diesel engine in the diesel range-topping Bluetec. It’s one of the world’s great diesels. Extremely quiet and refined but with plenty of torque and a smooth power delivery that keeps on giving. And, if you try really hard, it’s possible to coax more than 40mpg out of it. There’s much more in the way of standard kit offered in the new range which is a good thing, but prices have risen a bit, with an entry price of £38,465. That said, even the base models are good value given the new additions to the standard spec. There are three trim levels to choose from, depending on the engine you prefer with SE spec starting off the range with lovely suspension that marries up well with the relaxed nature of the driving experience. The next hop up takes you to AMG sport, which comes with some tasty styling upgrades but is bundled with the sports suspension which does no favours to the ride at the same time as doing little to help the handling. Even in full-on AMG Sport Plus trim, it’s not a sporty car – but, firm suspension aside, it does make for a wonderful cruiser with a well proportioned cabin, comfortable chairs and a gearbox that’s better suited to exploring the A roads than it is to belting round a race track. 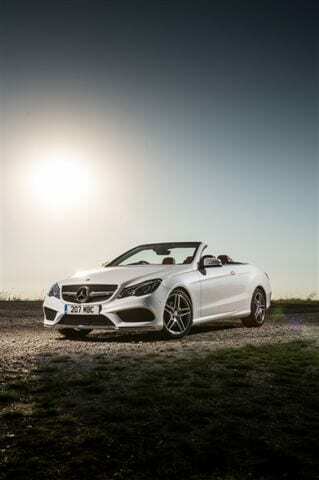 Settle for the fact that the E Class Cabriolet is more suited to wafting you along and it becomes immensely likeable. 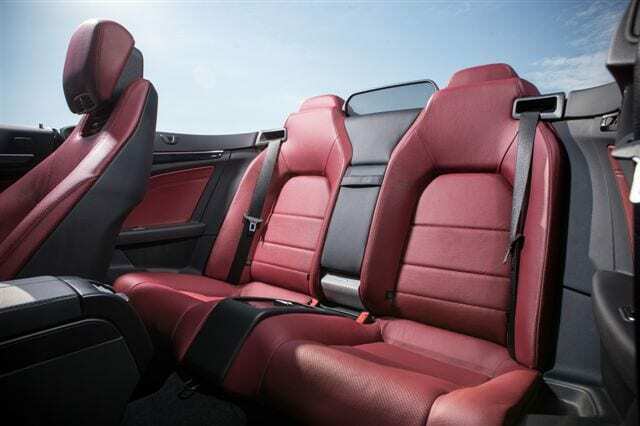 With the roof down, even in the depths of winter, it’s one of the most civilised drop-tops in the business. 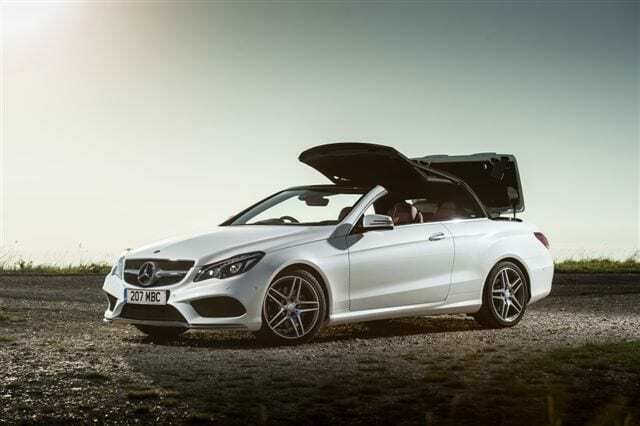 Mercedes has its brilliant ‘Airscarf’ system fitted to all its roofless cars which pipes warm air through a vent below the headrest and the rear headrests rise up at the touch of a button, taking with it a small wind deflector that keeps buffeting to a minimum. As well as the Airscarf and rear wind deflector there’s a new version of Mercedes’s clever ‘Aircap’ at the top of the windscreen, which lifts up as you go above 25mph to direct the air away from the inside of the cabin. Oddly, it makes a bit more noise with this in place and the wind deflector raised but it does a great job of keeping the rushing wind at bay and makes the E Class Cabriolet one of the best convertibles for rear-seat passengers. Of course, the fabric hood is raised and lowered electronically and, of course, it can be operated while in motion – at speeds of up to 25mph. It’s not the fastest ragtop in the business but seals beautifully with absolutely no wind noise when it’s in place. Practicality is another plus point. Rear seat passengers will find they have plenty of space and there’s a ski-hatch fitted to extend the boot which, even with the hood down, has plenty of room – although it is a slightly awkward shape for some luggage items. Mercedes Benz has, for a long time, been associated with some exceptionally clever technological innovations and the new E Class has seen its fair share fitted, either as standard or bundled in with the long list of optional extras. The Comand infotainment system remains largely unchanged but it’s brilliant anyway and there’s clever touches everywhere, from the high-tech headlights to the endless list of innovative safety features and driving aids. While it’s not short on included gadgets, the list of technology can be as long as your wallet will allow. BMW and Audi are fighting their own little battle with perfectly decent convertibles emerging from each camp – but you’d be foolish to ignore the new E Class. 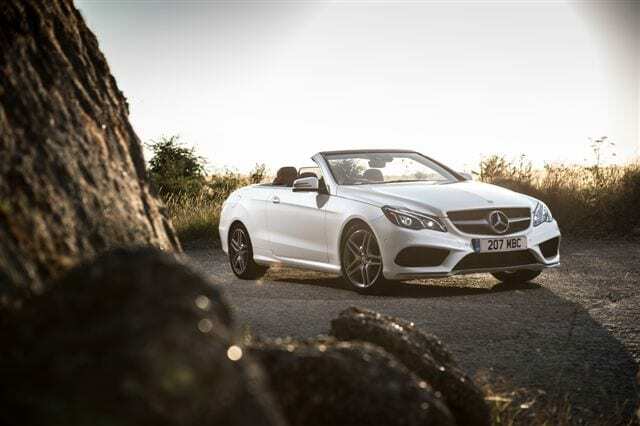 Take it for what it is, a comfortable and relaxed cruiser with one of the most pleasant roof-down experiences in the land, don’t expect too much in the way of thrills, and you’ll quickly find it’s one of the best convertibles on the market. I was recommended this blog via my cousin. I’m not sure whether or not this submit is written by means of him as no one else know such exact approximately my problem. You’re incredible! Thanks! « The 12th annual Rye Bay Scallops Week: 15 – 23 February 2014.